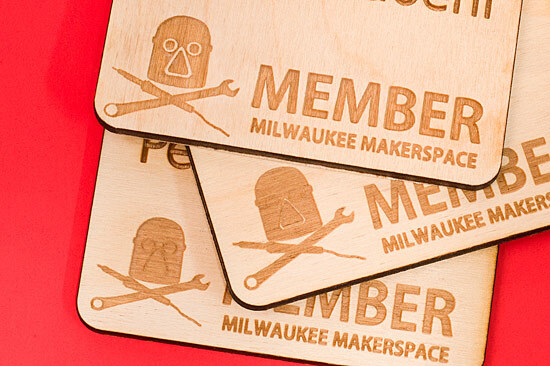 I made these laser-etched badges at Milwaukee Makerspace recently, and if you’ve see our logo before, you may have noticed it has some thin lines in it. 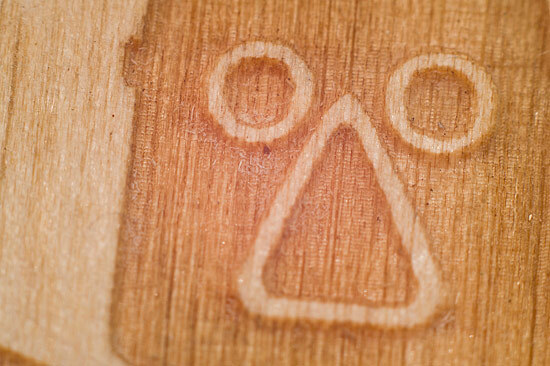 Thin lines are great, except when they aren’t, and when etching with the laser, they might not be. the photo above shows my three attempts, with the first being on the bottom, and the third being on the top. You can see the difference by comparing the helmet in each badge. The image above shows our standard helmet logo on the left, and you can see the line widths, which work fine for graphics we use online, or printed materials like flyers and stickers, but for laser etching, the lines are just too thin. 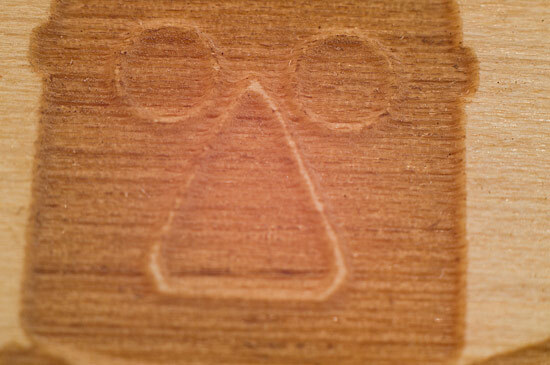 The middle logo shows how I tried to fatten up the lines to allow the etching around them to leave a bit more material (in this case 3mm Baltic Birch plywood.) Match the middle logo up with the middle badge in the photo above… it’s better, but still not great. Here’s a poor macro shot of the third attempt, the one with the fattest lines. This one worked out quite well, especially for the eyes and nose. The detail in the solder iron were completely lost, which is fine, as it’s extremely fine detail, and we’re etching it at a small size. I’m pretty happy with the final result, and I’ll keep in mind that thin lines may need to be fattened up in the future. (There’s always the issue of altering someone’s logo or artwork, but in cases like this it’s necessary if you want good results.) I don’t think there’s any hard and fast rules on this, as things will vary depending on size of artwork, material being etch, and other variables, but it’s a nice reminder that tweaking is needed for this type of thing to work well. Posted on Sunday, November 11th, 2012 at 10:46 pm. Subscribe to the comments feed. Both comments and pings are currently closed. Post on your own blog.